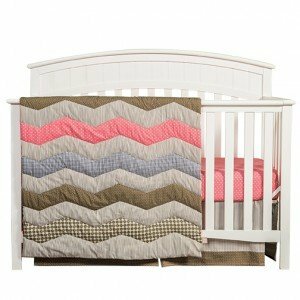 Patterned chevron stripes in lovely colors are delicately quilted together giving your nursery a beautiful homespun feel. Collection features a lovely mixture of pinstripes, mini dots, gingham and damask diamonds in a sweet color palette of coral pink, taupe, gray and white with accents of brown. The stylish chevron motif and color combination makes this collection perfect for your baby girl! If you have any questions about this product by TippyToesNYC, contact us by completing and submitting the form below. If you are looking for a specif part number, please include it with your message.